Chacko, Priya 2018. Foreign policy, ideas and state-building: India and the politics of international intervention. Journal of International Relations and Development, Vol. 21, Issue. 2, p. 346. Lindgren, Petter Y. 2016. Kōmeitō’s security ideals and collective self-defense: betwixt pacifism and compromises. East Asia, Vol. 33, Issue. 3, p. 233. MCGINLEY, WILLIAM 2014. Mechanisms and microfoundations in International Relations theory. 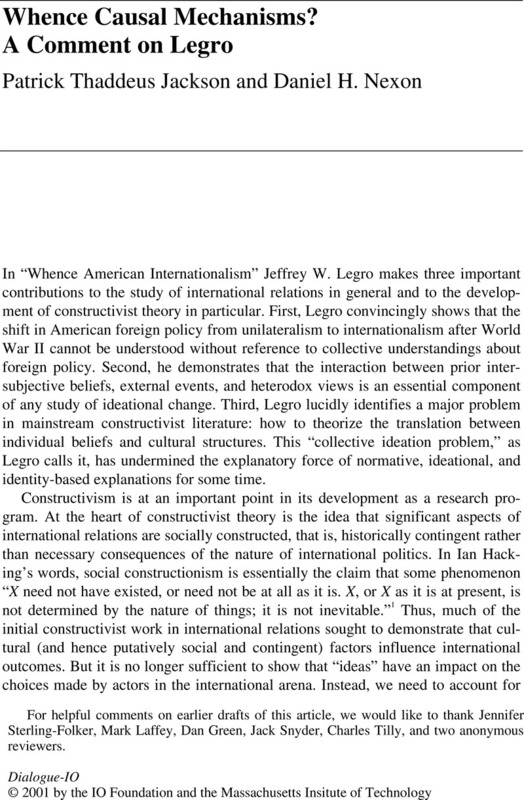 Review of International Studies, Vol. 40, Issue. 02, p. 367. Sil, Rudra and Katzenstein, Peter J. 2010. Analytic Eclecticism in the Study of World Politics: Reconfiguring Problems and Mechanisms across Research Traditions. Perspectives on Politics, Vol. 8, Issue. 02, p. 411. Kitchen, Veronica M. 2009. Argument and Identity Change in the Atlantic Security Community. Security Dialogue, Vol. 40, Issue. 1, p. 95.